Shweyga Mullah says the wife of one of Gadhafi's sons, Hannibal Gadhafi, poured boiling water on her head. 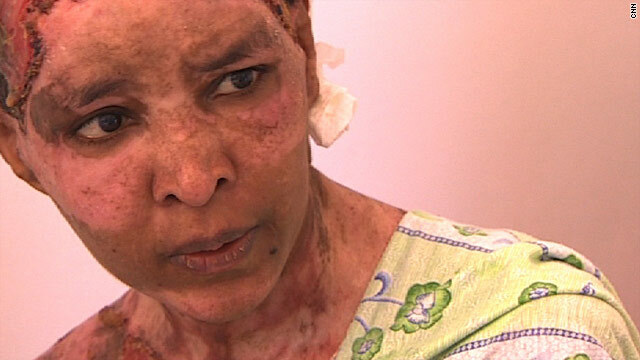 Tripoli, Libya (CNN) -- A nanny who suffered extensive burns when, she said, a relative of ousted Libyan leader Moammar Gadhafi's family poured boiling water on her, has left Libya for Malta, where she will receive additional medical treatment, according to CNN staff traveling with her. Shweyga Mullah's story pulled heartstrings worldwide. CNN journalists found her last month in the plush home of Gadhafi's son Hannibal Gadhafi after anti-Gadhafi forces overran Tripoli. Hannibal Gadhafi and his wife Aline fled to Algeria. Mullah was found sitting on the floor of an empty building. Mullah, who is in her 20s, worked as a nanny for two of the couple's children. When she couldn't keep one from crying, and refused to beat the child, she said Aline Gadhafi poured the boiling water on her head. "She took me to a bathroom. She tied my hands behind my back, and tied my feet," Mullah told CNN earlier this month from a Tripoli hospital where she was being treated after a guard secretly brought her in. "She taped my mouth, and she started pouring the boiling water on my head like this," she said as she imitated a vessel being poured on her head. that rendered her skin a grotesque patchwork. She actually had boiling water poured on her twice, she said -- once about six months ago and once about three months ago. Her chest, torso and legs are all mottled with scars -- some old, some still red and weeping. After both times, Hannibal Gadhafi and his family interfered with medical treatment, so she did not receive much, she said. Although Tripoli has a high standard of medical care, Mullah is leaving Libya out of concerns for her safety, as well as her peace of mind, according to CNN's Dan Rivers. The Maltese government has offered Mullah further medical treatment and asylum in the country -- even education, if she wants it. The government chartered the plane flying her from Misrata. But Mullah previously told Rivers she would like to go back to her native Ethiopia once she has recovered. She faces months of recuperation and surgery. Donors worldwide have given more than $38,000 for her care. Apparently she was not the only one who allegedly suffered abuse in the household. A man too frightened to reveal his name led CNN reporters earlier this month to another of Hannibal Gadhafi's properties, a gated, high-walled villa, where he said more abuse was meted out to staffers. The man said a Sudanese man was also scalded with hot water after he burned an undershirt he was ironing. Another foreign nanny also contacted CNN and described Aline Gadhafi as a "sadist" and "psychologically sick." Mullah said she came to Libya about a year ago after hearing jobs were available. Her two traveling companions returned to Ethiopia after refusing to work for Aline Gadhafi. She was supposed to be paid $300 a month, she said, but in the end was never paid anything.